I created the above illustration for Barbican’s Sci-fi poster competition. 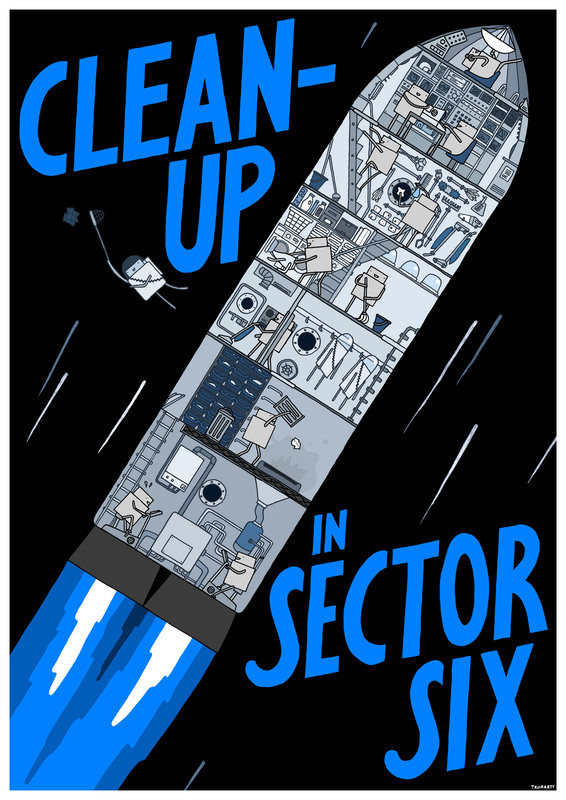 Clean-up in Sector Six imagines a team of domesticated robots commissioned to travel into junk orbit and collect the space junk that is floating out there. Inside their rocket ship, they dismantle the trash they capture, and after sorting it for valuables, use the rest as fuel for their engine that powers the ship. They’re kind of like space wombles! Of course, because their job is cleaning, they can’t help cleaning up their ship perpetually as well. I do like to think about junk orbit from time to time. Some of the stuff floating around up there would have been the most expensive objects ever created in their time. Now they just hover around out there, trying not to cause any accidents. Kind of like how I feel on the internet.